Generalized linear models (GLM) are a framework for a wide range of analyses. They relax the assumptions for a standard linear model in two ways. First, a functional form can be specified for the conditional mean of the predictor, referred to as the “link” function. Second, you can specify a distribution for the response variable. The rxGlm function in RevoScaleR provides the ability to estimate generalized linear models on large data sets. binomial "logit" "probit", "cauchit", "log", "cloglog"
inverse.gaussian "1/mu^2" "inverse", "identity", "log"
quasi "identity" with variance = "constant" "logit", "probit", "cloglog", "inverse", "log", "1/mu^2", "sqrt"
We’ll start with a simple example from Kabacoff’s R in Action book, using data provided with the robust R package. The data are from a placebo-controlled clinical trial of 59 epileptics. Patients with partial seizures were enrolled in a randomized clinical trial of the anti-epileptic drug, progabide. Counts of epileptic seizures were recorded during the trial. The data set also includes a baseline 8-week seizure count and the age of the patient. 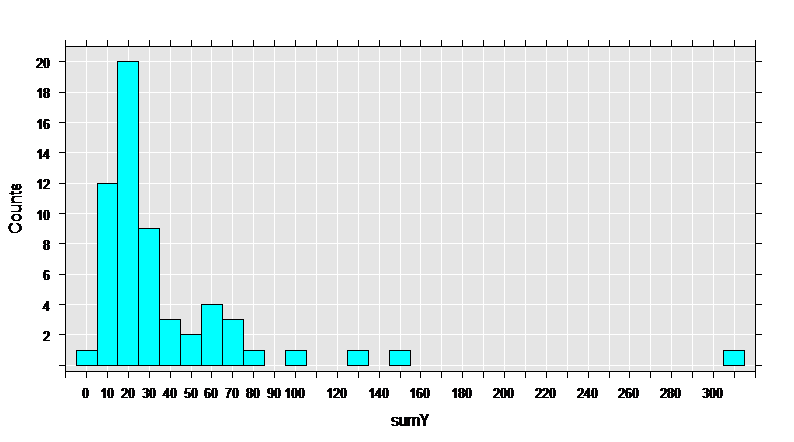 First, let’s get some basic information on the data set, then draw a histogram of the sumY variable, containing the total count of seizures during the trial. The data set has 59 observations, and 12 variables. The variables of interest are Base, Age, Trt, and sumY. To estimate a model with sumY as the response variable and the Base number of seizures, Age, and the treatment as explanatory variables, we can use rxGlm. A benefit to using rxGlm is that the code scales for use with a much bigger data set. This suggests that, controlling for the base number of seizures and age, people taking progabide during the trial had 85% of the expected number seizures compared with people who didn’t. A common method of checking for overdispersion is to calculate the ratio of the residual deviance with the degrees of freedom. This should be about 1 to fit the assumptions of the model. We can see that the ratio is well above one. Notice that the coefficients are the same as when using the poisson family, but that the standard errors are larger. The effect of the treatment is no longer significant. But, these estimates are conditional on the fact that a claim was made. The Tweedie family of distributions provides flexible models for estimation. The power parameter var.power determines the shape of the distribution, with familiar models as special cases: if var.power is set to 0, Tweedie is a normal distribution; when set to 1, it is Poisson; when 2, it is Gamma; when 3, it is inverse Gaussian. 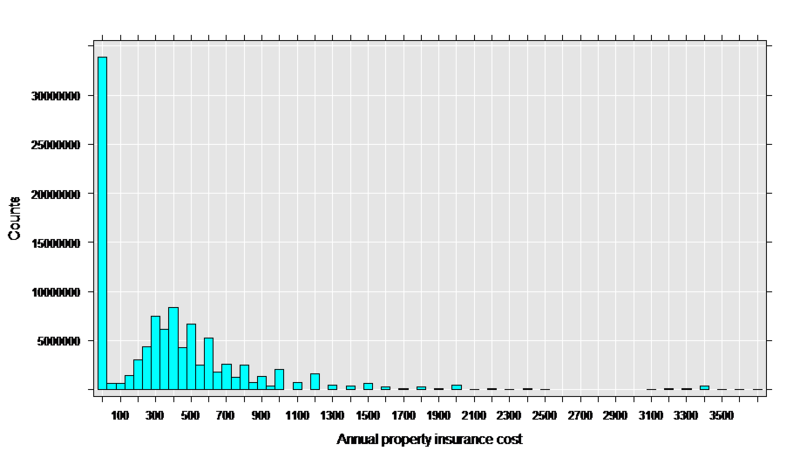 If var.power is between 1 and 2, it is a compound Poisson distribution and is appropriate for positive data that also contains exact zeros, for example, insurance claims data, rainfall data, or fish-catch data. If var.power is greater than 2, it is appropriate for positive data. An Xdf data source representing the new data file is returned. The new data file has over 5 million observations. This data appears to be a good match for the Tweedie family with a variance power parameter between 1 and 2, since it has a “clump” of exact zeros in addition to a distribution of positive values. Stepwise generalized linear models help you determine which variables are most important to include in the model. You provide a minimal, or lower, model formula and a maximal, or upper, model formula. Using forward selection, backward elimination, or bidirectional search, the algorithm determines the model formula that provides the best fit based on an AIC selection criterion or a significance level criterion. 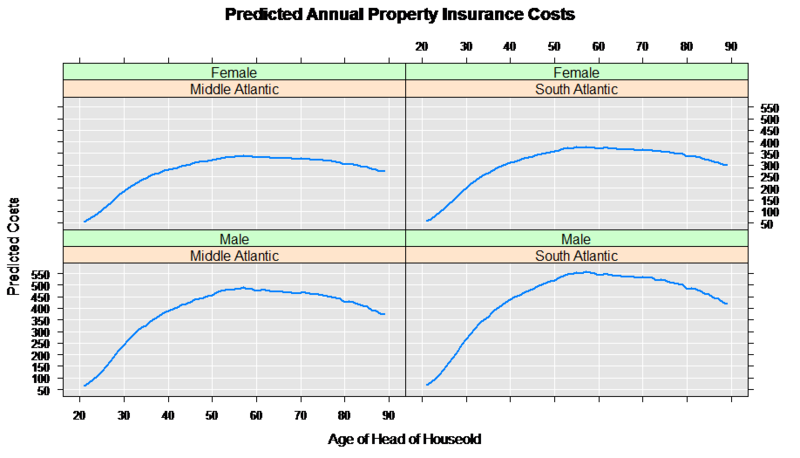 We see that in the stepwise model fit, age no longer appears in the final model. The ability to save model coefficients using the argument keepStepCoefs = TRUE within the rxStepControl call, and to plot them with the function rxStepPlot was described in great detail for stepwise rxLinMod in Fitting Linear Models using RevoScaleR. This functionality is also available for stepwise rxGLM objects.